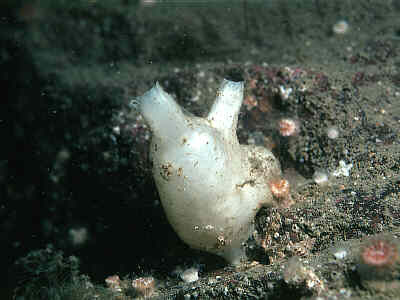 Description: A large grey or brown wrinkled solitary ascidian. The test is thick and leathery and usually covered with adhering silt, shell particles, etc. The siphons are long, the oral one terminal and usually curved to one side, the atrial one lateral. The body is conical in shape, broadest at the base, where it is attached to rock or shells. The siphons are somewhat square in cross section sometimes with white markings inside the slightly fluted entrance. 50mm tall x 30mm broad. Habitat: In sheltered and semi-sheltered conditions attached to shells and silty rocks. Distribution: All around the British Isles. Similar Species: Similar species are Polycarpa scuba, which is smaller with a thinner test, and Pyura microcosmus which has a thicker test and longitudinally striped siphons. Another similar species is Polycarpa fibrosa. Tall conical body with oral siphon deflected to one side. Picton, B.E. & Morrow, C.C. (2016). Polycarpa pomaria (Savigny, 1816). [In] Encyclopedia of Marine Life of Britain and Ireland.